Kids Say The Darndest Things About Video Games - Fortnite, Mario, and Mr. Do! 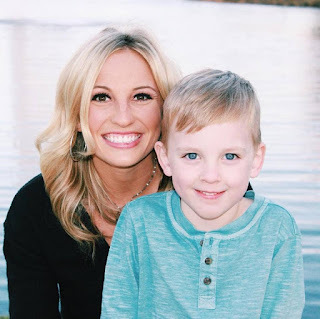 Funny Easter story about my five-year-old great nephew Cooper (pictured here with my niece Emily, his mom). He asked me about my favorite video game. I told him what I tell everyone: "Mr. Do!" After giving me a funny look, he told me his favorite was "Fortnite." Then Cooper asked if I had written any other books with pictures. I showed him my"100 Greatest" book that covers 1977 to 1987. He flipped through it and asked me about several of the games since he didn't recognize them. I then turned to the "Super Mario Bros." chapter with the pixelated image of Mario. He said, "Oh, there's the 'Minecraft' Mario." #1. KISS is one of the most popular bands of all time, so it only makes sense that “My Interview with Lydia Criss, Ex-Wife of Original KISS Drummer Peter Criss” gets the top spot. You can read it HERE. #2. It seems that everyone wants to sell their old stuff, or at least likes the idea of being a retailer on a small level. This explains why “Opening a Booth in an Antique Mall” is a popular article. You can read it HERE. #3. When cheating scandal over Dragster for the Atari 2600 made news, it hit the mainstream. 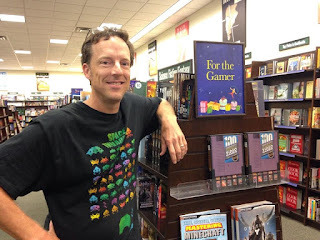 Thus, my feature called “Todd Rogers - A Funny Thing Happened at a Video Game Convention” is a perennial favorite. You can read it HERE. #4. I was pretty wild during the 1980s, and people seem to get a kick out of reading about the times when I met famous rock stars. 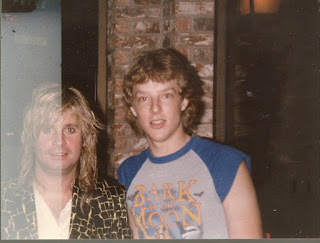 Check out “I Was a Teenage Concert-Goer--Or, How I Met Ozzy Osbourne & Paul Stanley” by clicking HERE. #5. 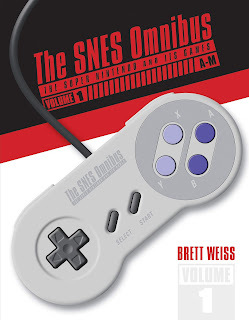 People like to sample before they shop, so “Look Inside - Brett Weiss's Retro Gaming Books” gets lots of clicks. You can read sample pages of my books HERE. Thanks for the clicks, and thanks for reading! 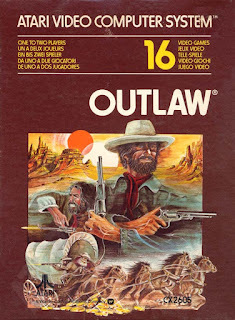 One of the first games designed by David Crane of Activision fame, Outlaw for the Atari 2600 is both a target shooting contest and a shootout game in one cartridge. When playing by yourself, you score points by shooting a moving target. When challenging a friend, the two of you (one gunslinger on the left and one on the right) fire away at each other. Outlaw features 16 variations of play. 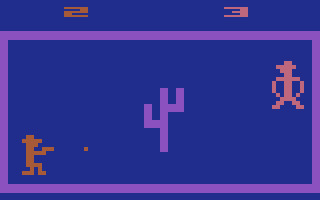 In each of the games, an object such as a cactus, a wall, or a stagecoach moves or stands between the gunslingers, or between the lone gunslinger and the target. 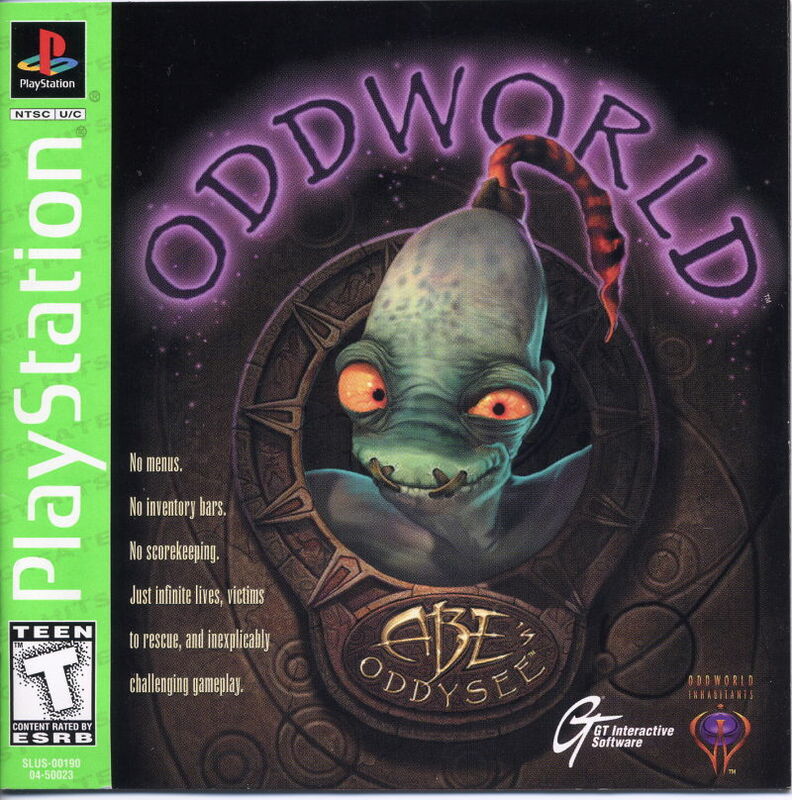 In the two-player games, the first player to score 10 points wins. In the one-player games, you've got 99 seconds to score a maximum of 10 points. 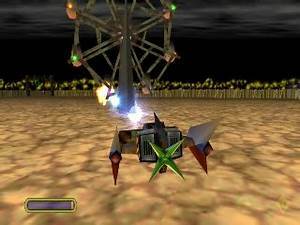 Outlaw was patterned after Midway’s Gun Fight, which hit the arcades in 1975. Some things, like going to amusement parks and sporting events, aren’t much fun by yourself. You can add playing Outlaw to that list. Played alone, Outlaw is an overly simplistic and boring game. Played with a friend, however, it is a kicking good time. You'll laugh a lot as you and your frenemy duck behind and break through the various obstacles, taking potshots at one another. Like most of the early Atari VCS games—Fun With Numbers and Maze Craze come immediately to mind—the graphics in Outlaw are barebones to say the least. 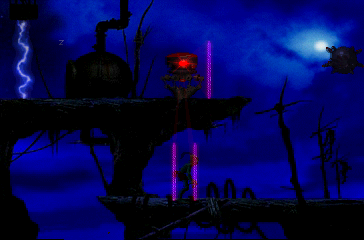 With his cowboy hat and crouching shooting stance, the gunfighter is recognizable as such, but overall the sprites and color schemes are basic. When compared to other games of the day, however, Outlaw doesn't look too shabby. One appealing aspect of Atari VCS cartridges from the late 70s was the number of gameplay variations. Many titles boasted at least 16 different games in one cartridge. While these extra games were generally minor variations on a basic theme, at least it seemed like you were getting more for your money. In Outlaw, the variations are certainly welcome. The difference between shooting through a wall and shooting past a stagecoach is indeed significant in terms of the strategies used for hitting your opponent while avoiding his or her gunfire. Outlaw is an imminently playable game that offers a good amount of enjoyment. Shooting through the obstacles to get to your opponent is a blast. However, when compared Combat, which is the best two-on-two shootout game from the era, it comes up a little short. With its tanks and planes, Combat offers more challenges, variations and excitement. 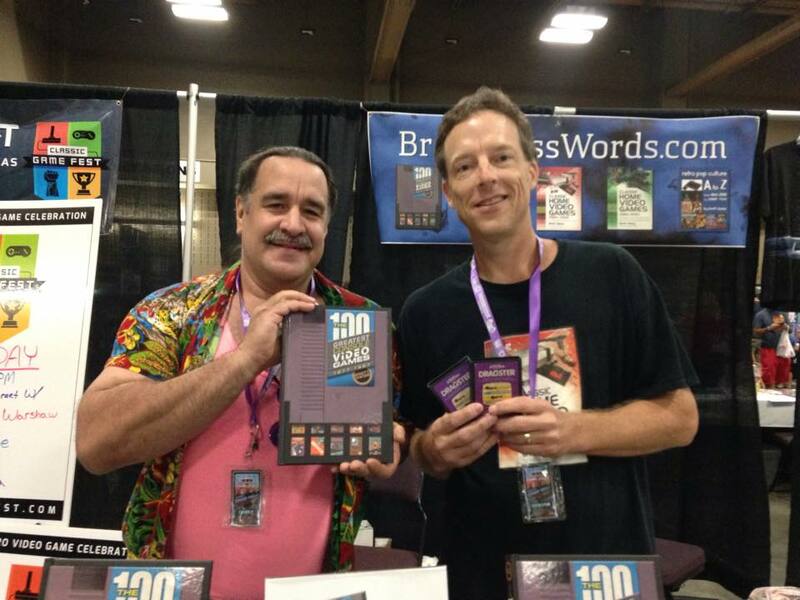 Check out my Atari 2600 book HERE. 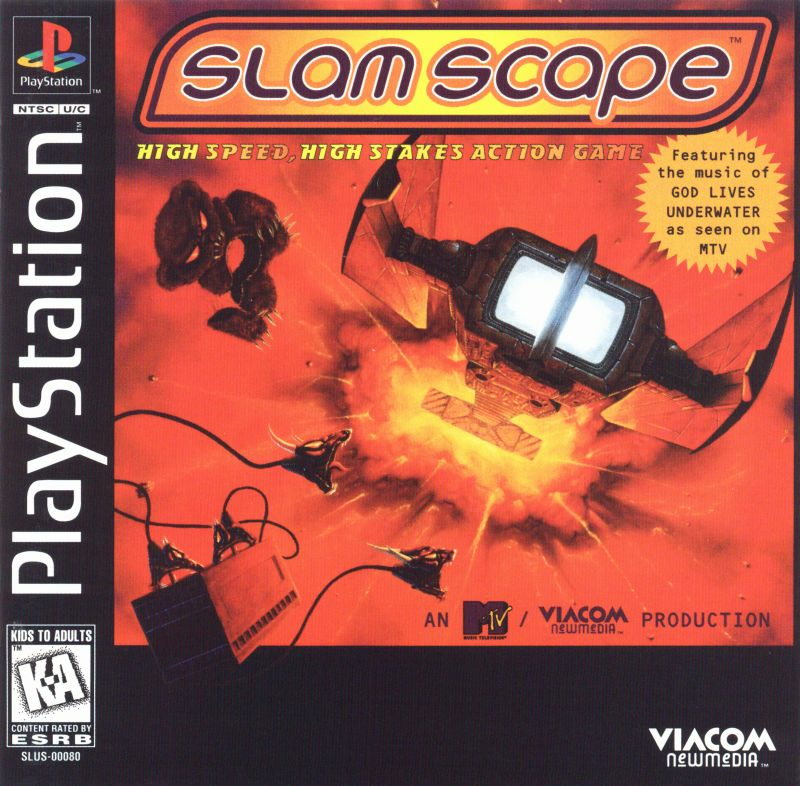 SlamScape for the PS1 is a 3D, behind-your-vehicle shooter set in a surreal world of bomb-throwing ferris wheels, deadly teddy bears, exploding balloons, bottled brains on unicycles, a Scary-Go-Round, a spinning seagull named Gullicopter, a monstrous creation called Crabzilla, and other bizarre enemies. Your objective is to pilot a rocket-mounted pile driver called a Slamjet while shooting, blasting, smashing, and jumping most everything you see throughout four dangerous regions. 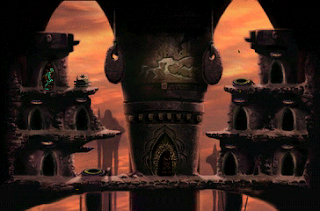 Derived from your subconscious, the regions contain four heavily guarded Orb-Ids needed for level progression. Once you obtain these items, you'll take them to a central location within that level. You must employ a different strategy for each orb you wish to obtain. Obtaining the Orb-Ids won't be easy as you're going up against 16 blood-thirsty opponents lusting for victory. While the default weapon is a Shockball, there are a variety of special weapons including Minetraps, a Fasterblaster, a Ripstar, and a devastating Torp, which is the most powerful item available. While flying in your futuristic craft, Nodensnaggers and Power Leeches will land on top of you, zapping your energy and draining your power. SlamScape features a 3D graphics engine running at 60 frames per second and supports analog controls. Electro-rockers God Lives Underwater lent their musical talents for the interactive soundtrack. If SlamScape weren't so limited in scope, it would be difficult to know where to begin this review. The game fails miserably in just about every area of gameplay. 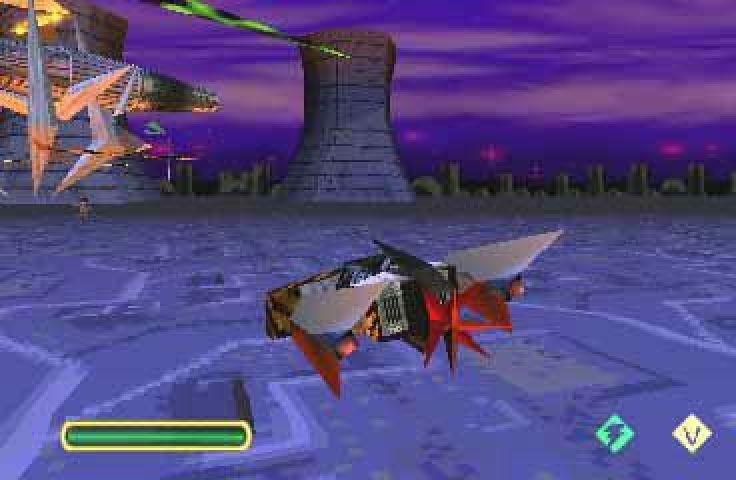 For starters, the Slamjet is terribly hard to control. It bounces around in the general direction you intend to go while spinning and sliding unintentionally into a wide assortment of strange but unappealing enemies. Precision moves are nearly impossible to perform. When you do manage to land a shot, it usually just barely injures whatever you're firing at. On other hand, your ship is killed easily after just a few hits. You're better off trying to avoid most of your adversaries than taking them on directly. Needless to say, this gets boring and frustrating very quickly. 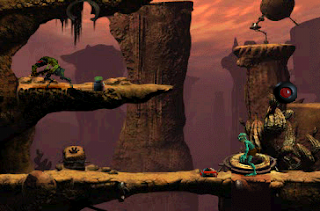 To make this game even more of a pain, off-screen enemies suddenly appear without warning and leech themselves to your vessel, sucking your energy dry. As if the game wasn't difficult enough already! 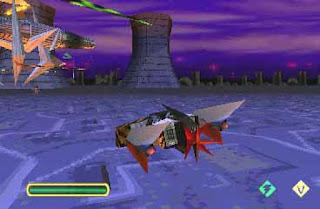 Most of the better shooters involve the destruction of hundreds of enemies as many people play these kinds of games, at least in part, to blow off steam and relieve stress. 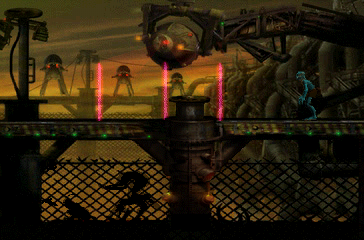 Other gamers simply get a kick out of wanton (but harmless) destruction. 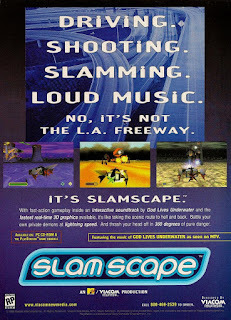 SlamScape offers almost nothing of interest in any of these areas. 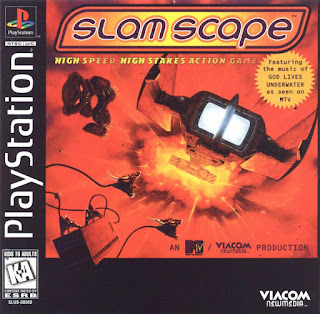 If anything, playing this game will make you want to pull your controller out of the PS1 and “slamscape” it into the wall. Everyone needs a few hard games in their collection, but poor controls and undue frustration do not make for a fun game. Included in this package are three music videos by obscure alt-rock grunge/electronic band God Lives Underwater. Although tolerable, they're not a great band by any stretch; their music is as hackneyed as their name. 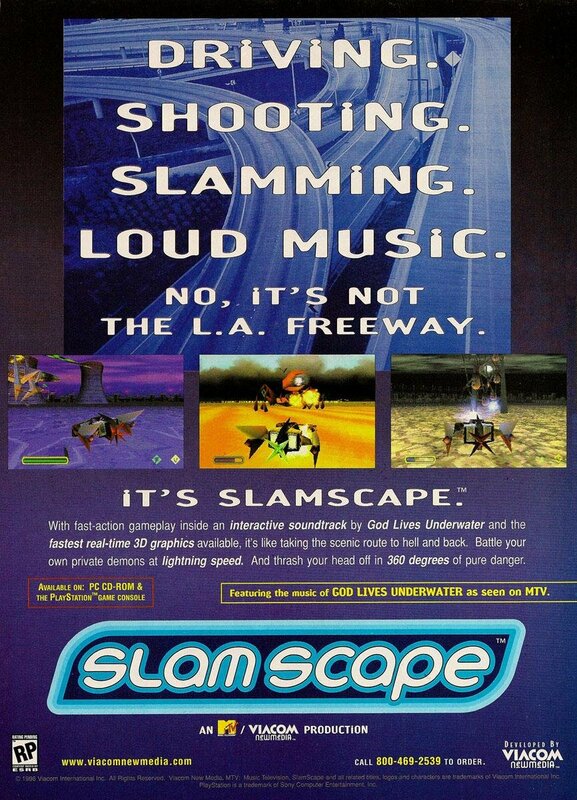 Sadly, the music videos are the best thing about SlamScape. 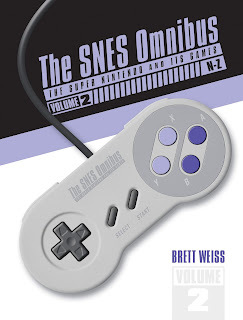 Amazon has a great deal going: The SNES Omnibus two-volume set is on sale for less than $67.34, which is a nice discount off the combined cover price of $99.98. As of this post, The SNES Omnibus: The Super Nintendo and Its Games, Vol. 1 (A–M) is $34.28 while The SNES Omnibus: The Super Nintendo and Its Games, Vol. 2 (N–Z) is $33.06. Check out sample pages from Vol. 1, which is available now, HERE. Check out sample pages from Vol. 2, which is shipping April 28, HERE.